On 31/01/2019 the team at MOTIONrehab updated their training to include the new functions of the Bioness L300 GO FES device. Our clinicians are extremely experienced at the use of Functional Electrical Stimulation for walking and have used the Bioness FES devices since their introduction into the UK over 10 years ago. Bioness have launched the new L300 GO FES which offers the latest FES technology to treat drop foot. The L300 Go is the world’s first FES system that integrates smart 3D motion detection to trigger the electrical stimulation. This means individual’s no longer need a sensor in their shoe to trigger the device. Individuals can realise the benefits of the FES whilst walking bare foot. The advanced software in the L300 Go detects particular events during walking to provide stimulation precisely when it is needed. This means that the foot is still lifted to avoid the toes catching even when walking at speed, on stairs, ramps, and over uneven terrain. Can the Bioness L300 Go help you? MOTIONrehab would recommend an assessment to see if FES can help. FES can be helpful for weakness caused by damage to the brain or spinal cord following a Stroke or other neurological conditions such as Multiple Sclerosis (MS) or Cerebral Palsy (CP) Unfortunately if the drop foot is caused by injury to the peripheral nerves (nerves once they have left the spinal cord) then FES is not appropriate. 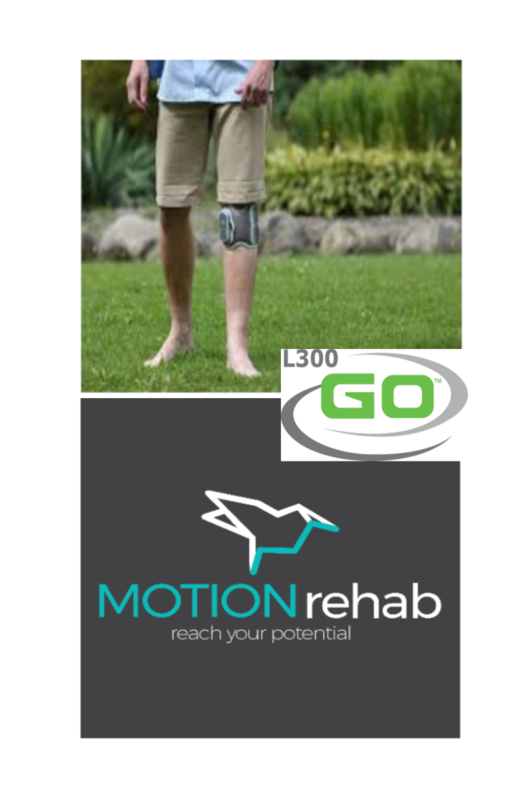 At MOTIONrehab we would recommend an assessment with one of our highly trained neurological physiotherapists to see if the L300 GO is suitable for you.